Birth Date Controversy: Woodrow Wilson was born in 1856 in Staunton, Virginia. The actual date of his birth has been the subject of some controversy. According to the family Bible he was born 45 minutes into the new day on December 29, 1856, although he always celebrated his birthday on December 28. See my earlier blog on this subject. 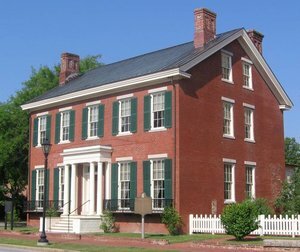 Growing Up in Georgia: In 1858, the Wilson family moved to Augusta, Georgia, and young Thomas Woodrow Wilson (for that was his original name and he was known as Tommy as a youngster) lived in the manse of the First Presbyterian Church while his father served as the pastor there from 1858 to 1870. 27th or 28th President? 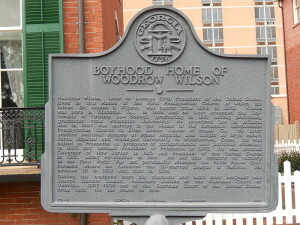 His boyhood home in Augusta is now an historic site and a plaque stands outside of the building summarizing his life. The plaque incorrectly notes that Wilson was the “27th President of the United States,” when, in fact, he was the 28th President. 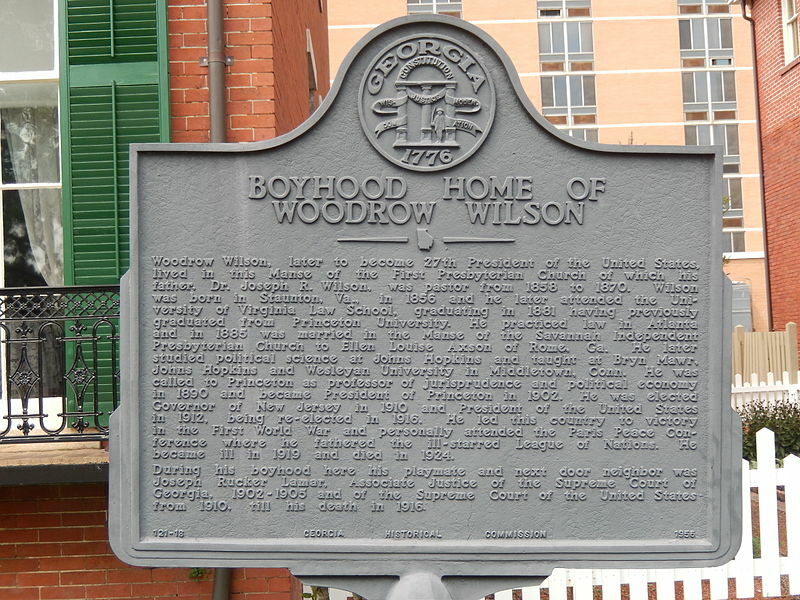 Even the website for The Boyhood Home of President Woodrow Wilson notes that Wilson was our 28th President. Numbering the Presidents: How could they get such an important basic fact wrong? Undoubtedly, the aberration in numbering Wilson goes back twenty years before Wilson took the oath of office on March 4, 1913. In the election of 1892, former President Grover Cleveland came back to defeat President Benjamin Harrison, the man who had defeated him for the presidency in 1888. Most presidential scholars and historians refer to Cleveland as both our 22nd and 24th president. However, a small minority, especially in the early to mid-twentieth century often referred to him only as the 22nd president. Thus, if Cleveland is only counted once as the 22nd president, then Wilson would be our 27th president, not our 28th. But today, the vast majority of presidential historians count Cleveland twice, and thus Wilson was our 28th president. For example, Barack Obama is referred to as the nation’s 44th president, a numbering system that counts Cleveland twice. Fixing the Sign: I’m sure it would be quite costly to fix the sign outside Wilson’s boyhood home in Augusta, Georgia to reflect that he was actually our 28th President.